Entertaining and need a special dessert? 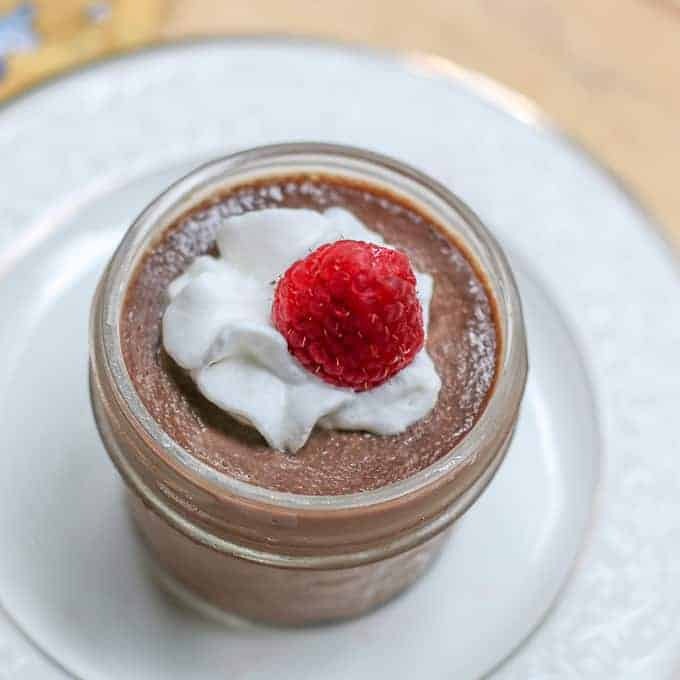 This Dark Chocolate Pots De Creme is the ultimate chocolate dessert. It is rich, creamy, and decadent. Your guests will be sure to love each and every bite! We have an eclectic little general store here in Fayetteville, NC called Leclair’s General Store. It sells everything from antiques to modern day hand woven baskets and Pendleton blankets. It is the perfect stop for hand selected wines, fine beers, little gourmet staples, and coffee. My personal favorite is their cold brew. I have never liked cold coffee and somehow I have become addicted to the stuff. 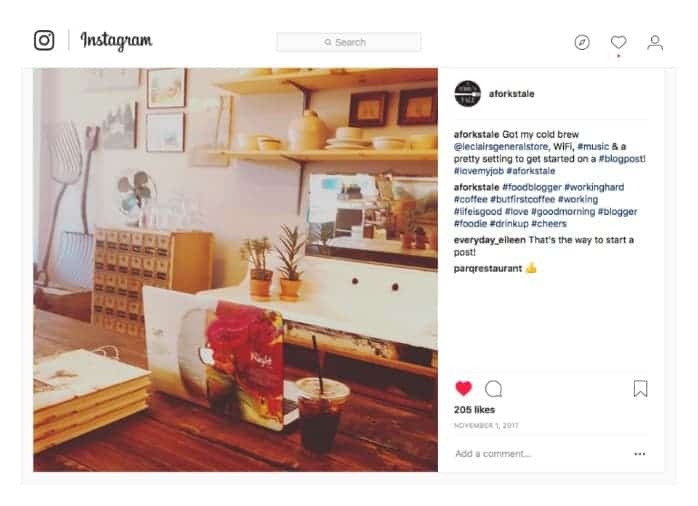 Patrick, the owner, was once the director of visual presentation for Ralph Lauren. He left designing the NYC Ralph Lauren’s store fronts and the hustle and bustle of the big city; to the more relaxed small town feel of Fayetteville. He employs his talents to cultivate a unique chemistry of pairing old with the new through design, wine, and coffee. With it generates an energy of community, creativity, and a sense of comfort. 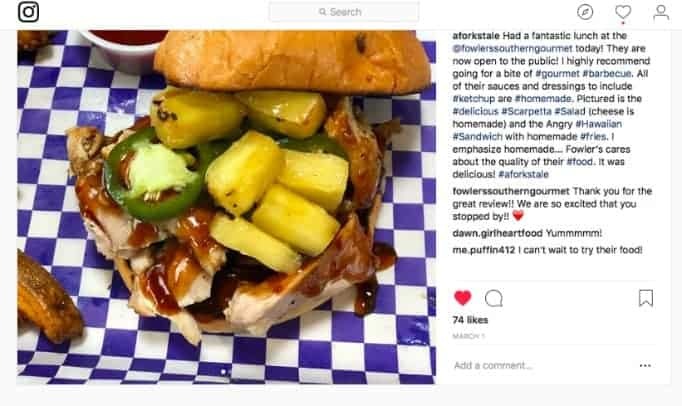 Fowler’s Southern Gourmet barbecue is not your everyday barbecue. It is a family owned business serving gourmet, made from scratch smoked meats, sauces, and sides. They have a reputation of selling out some of their prized meats such as their tender juicy ribs or their “burnt ends” pork belly. This is because they believe in quality versus quantity and smoke their meats daily. Almost everything is made from scratch from their ketchup for their hand cut fries to the stracciatella cheese on their salad. You won’t ever leave hungry because the portions are big and the food is too good not to finish. Therefore, when asked to collaborate with Dave Fowler (one of the owners), I have to admit I was a bit intimidated! After getting over my immediate queasiness and jitters, I convinced myself to think…. What do I like at the nice restaurants that I can transport easily with and that would pair nicely with a sweet, oaky wine???? And so became my recipe for Dark Chocolate Pots De Creme. Thank Goodness I did a few trial and runs with my chocolate pots de creme before my big debut… With my first batch, the top 80% set beautifully and the bottom 20% was runny. I was like, “what did I do wrong?” My dear BFF blogger friend, Karrie from Tasty Ever After, asked me if I was heating up the water bath enough. I was like…. ugh no… I was just using room temperature tap water. She pointed out that I needed to use boiling water or very very hot water for the water bath so it can match the temperature in the oven for an even bake. BINGO! The next batch of chocolate pot de creme came out BEAUTIFULLY. Another thing I learned in creating these chocolate pot de creme is that not all chocolate is created equal. This is not a dessert to skimp on with the cheap chocolate. Cheap chocolate not only tastes differently from the good stuff, it also melts differently. Save yourself some heartache and splurge a couple of bucks. 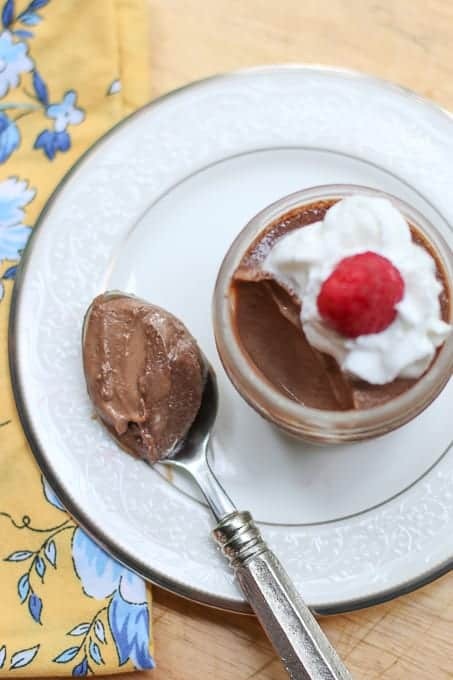 It is well worth it to make for this chocolate pots de creme dessert! The wine tasting was a fantastic experience. The wine was great. The food from Fowler’s was incredible. My dessert was a hit. And the comradery in working with Patrick and Dave was epic. I love working with creative people with strong work ethics. I feed off the good vibes. I can’t wait for our next endeavor. 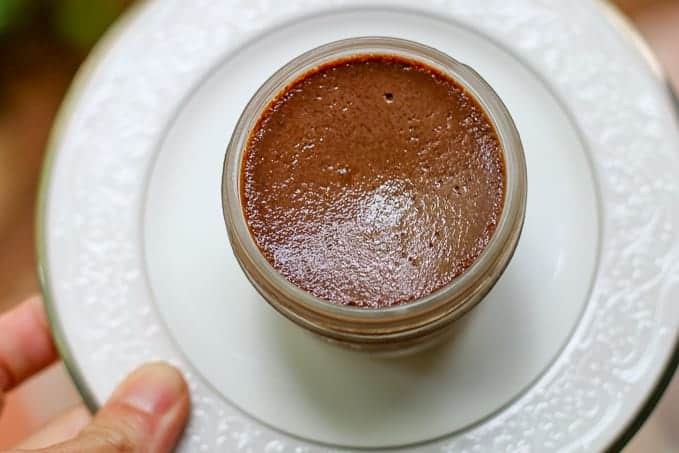 *NOTE* This Dark Chocolate Pots De Creme is delicious plain. However for a nice twist, it is delicious topped with just a pinch of coarse, crunchy salt. For a pretty presentation, you can top it with whipped cream and a little red raspberry. Any of these options will be perfect. In a sauce pan, combine heavy cream. Cook on low heat, stirring continuously until simmering. Add the chocolate and whisk until melted. Allow to cool slightly. In a mixing bowl, mix eggs yolks, sugar, and vanilla. Slowly add the chocolate mixture, continuously whisking until combined. Strain chocolate mixture through a fine mesh strainer. Evenly pour into 6 4oz ramekins. Place ramekins in a roasting pan or 9x13 baking dish. Fill pan with almost boiling water or very hot,hot water until it reaches half way up the ramekins. Bake 30 to 35 minutes until custards are set. The edges should be set but center should be jiggly. Cool on wire rack. Refrigerate 3 to 4 hours to completely firm before serving. 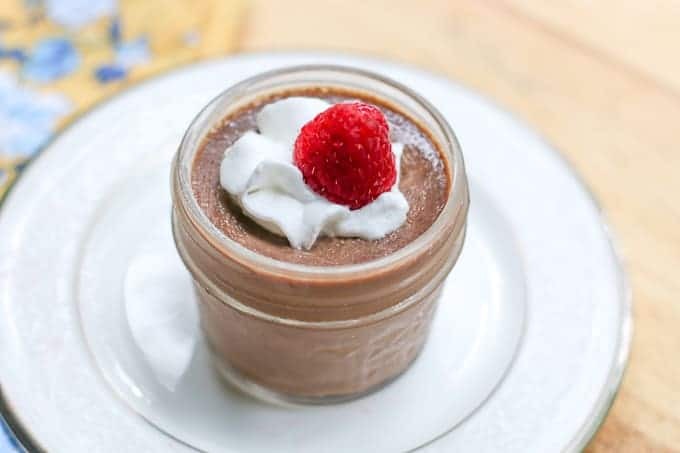 This Dark Chocolate Pots De Creme is delicious plain. However for a nice twist, it is delicious topped with just a pinch of coarse, crunchy salt. For a pretty presentation, you can top it with whipped cream and a little red raspberry. Any of these options will be perfect. I love a rich, chocolate dessert! This looks delicious! This looks so pretty and delicious! Chocolate dreams here I come! This is a lovely treat. Easy, delicious and decadent does it. Oh my goodness, yes. This is heaven in a jar! Desserts like this have that lovely sense of being decadent and elegant. Looks like a lovely treat, great for a special occasion or entertaining. Looks so rich and delicious yet so simple to make. I can’t wait to satisfy my chocolate craving with this dessert.